Wrong-side-of-the-road driving, but everybody does it so it’s okay. 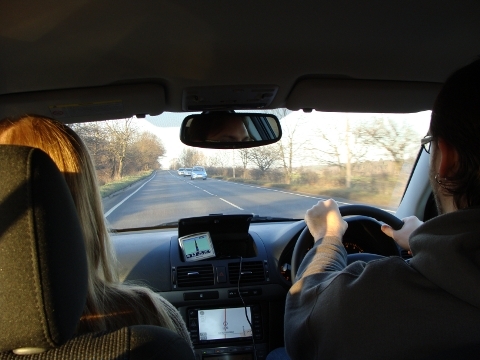 On Christmas day, Tiana and I drove to Manchester to pick up Tiana’s Mum who was to visit for just under two weeks. We had to rent a car on Christmas Eve because no forms of public transportation are running on Christmas day. So, we picked up a car complete with GPS, which was rather helpful. “Go straight through the roundabout, second exit.” “Turn left, then right.” “Turn left, then, left.” “Turn around.” “Turn around as soon as possible.” Oh wait — that’s what happens when you start going in the wrong direction for too long. Driving on the left (some say wrong) side of the road wasn’t too hard, but it definitely took some getting used to. Roundabouts were easy enough, but turning right in intersections seemed counter intuitive because of having to pull into the left lane. Keeping oneself positioned right-of-centre was a little difficult at first (especially since in the States you are left-of-center in the road), but I got the hang of it…after going over a few curbs. We rented a car a second time toward the end of the trip and I forgot to tell the rental place to get an automatic so I had to end up driving a manual. Ultimately, I did just fine, it’s just that on the first night when taking it home on New Years Eve during rush hour, I stalled it about six or seven times. At least I didn’t put it in reverse going 70 mph, like I did once with my old car (Hi, Rusty!). All in all I probably put in somewhere between 400-500 miles of driving doing two trips back and forth to Manchester, and one trip to Warwick Castle & Stratford-upon-Avon and back. We were scouting locations for In Reverent Fear’s next music video. They love castles, armor, mountains, and all things epic. 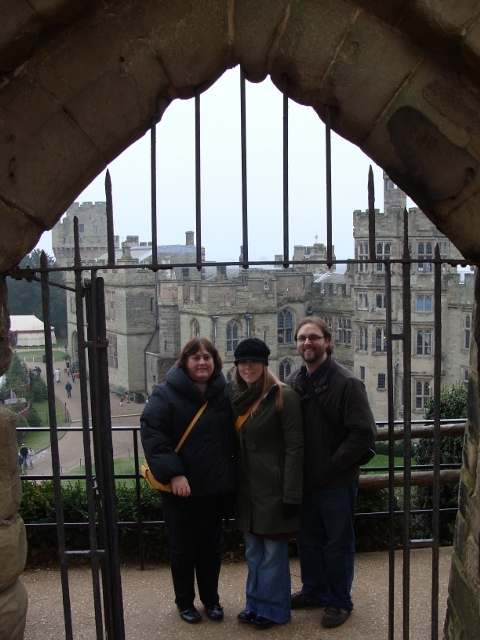 Now that I’ve rambled on long enough about driving, we did do some pretty cool stuff, like visiting Warwick Castle on New Year’s Day (see above), which was totally magnificent. I’m not sure I’ve been to a castle that was still in one piece, more or less (ehem, Nottingham Castle!). We could have probably spent all day there, but we saw most of what we came to see I think. Henry VIII owned it at one time but I don’t think he lived there. Did you know he wore a codpiece? Dumb! After Warwick Castle, we drove to Stratford-upon-Avon to see Anne Hathaway’s cottage. I have some pics of the outside, but they wouldn’t let me take any of the inside for the usual vague “insurance concerns” reasons. You know, the usual Jedi mind trick of “these are not the droids you’re looking for” can turn tourists into mush. We had other fantastic times together, walking around Nottingham visiting shoppes, showing Tiana’s mum to decent pub food, visiting Sherwood Forest (the Major Oak lives up to its name), and even did a little exploring in the basement of our building where we discovered a bunch of old photography developing equipment. There was a box of rejected photos, some of which I kept so that I can write horror stories about their contents later (don’t worry, nothing ‘bad’). One of the high points from the trip was when we went to this posh place here in Nottingham called ‘The Walk’. My friend Alex pointed it out to me once, indicating that it was an example that there is still some class left in Nottingham. He was quite right. It was really nice to have Tiana’s mom visit. It was good to have a lot of things to do during our first Christmas away from home. I miss my own family quite a bit. 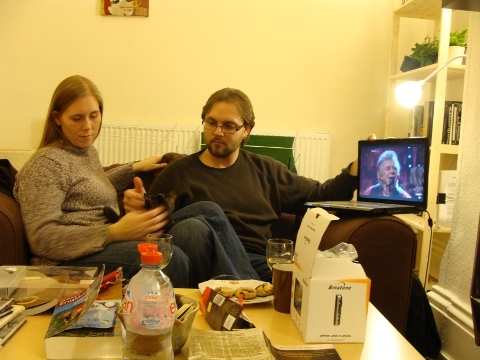 We did a little bit of Skyping on Christmas day which was nice, but it’s not the same. Over the last year or so, I’ve grown rather fond of visiting my hometown of Merced. For reasons I won’t go into, the only reason I have wanted to go home since I moved to San Diego in 1998 was to visit family — and that’s absolutely it. I had no friends in Merced by the time I left for college, so aside from visiting family, there was nothing else for me to do there, so going home was always bittersweet. It seems like it finally took about ten years for me to look forward to visiting the actual town–perhaps because I was about to move to the UK for three years. Or more importantly, because my brother and sister-in-law have an extremely adorable daughter that I love so much. I guess one way to inject life into a situation is to actually, um, give birth to it!